Intussusception is the invagination of a part of the intestine into itself, in other words is the prolapse of one part of the intestine into the lumen of an immediately adjoining part. It is the most common abdominal emergency in early childhood. Epidemiology: Most episodes of intussusception occur in otherwise healthy and well-nourished children. Approximately 60% of children are younger than one year old, and 80 percent are younger than two. Is the most common cause of intestinal obstruction in children between 3 months and 6 years old. It appears to have a slight male predominance with a male:female ratio of approximately 3:2. Etiology: The vast majority of cases is unknow. Another causes are Meckel’s diverticulum, polips, intestinal tumors, Henoch-SchÃ¶nlein purpura, strange bodies, etc. The most common form of this disease is the ileo-colic and ileo-ileo-colic invaginations. It could be associated with the rotavirus vaccine. Clinical picture: Acute onset of intermittent, severe, crampy, progressive abdominal pain, accompanied by inconsolable crying and drawing up of the legs toward the abdomen. This painfull episodes occurs at 15 – 20 minute intervals and then become more frequent and severe. Vomiting may follow episodes of abdominal pain. This episodes can be followed by vomiting and the passage of “currant jelly” stool (a mixture of blood and mucous). A sausage-shaped abdominal mass may be felt in the right side of abdomen. The prevalence of blood in the stool is as high as 70% if occult blood is included. Diagnosis: It is based on index of suspicion, frequently the diagnosis is stablished with contrast studies (wich could be also therapeutic). 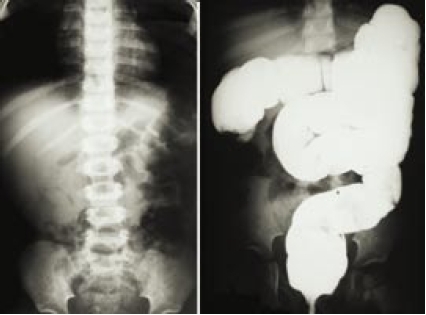 The abdominal plain film (see below) may be helpful because they may show frank intestinal obstruction or massively distended loops of bowel with absence of colonic gas. The ultrasound can be useful also, with a sensitivity and specificity approach 100%. The classic finding is a “bull’s eye” or “coiled spring” lesion (see below) representing layers of the intestine within the intestine. 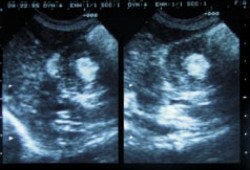 Treatment: Nonoperative reduction using barium or air contrast techniques is successful in approximately in 75 – 90% (in the first 24 hours) of patients with ileo-colic intussusception. Surgery is indicated when nonoperative reduction is incomplete or when a persistent filling defect, indicating a mass lesion is noted. Broad-spectrum intravenous antibiotics should be given before surgery. Manual reduction at operation is attempted in most cases, but resection with primary anastomosis needs to be performed if manual reduction is not possible or if a lead point is seen.